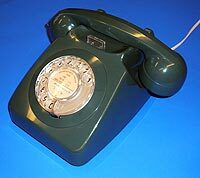 The GPO 700 series of telephones was introduced in 1959 with the 706 design. 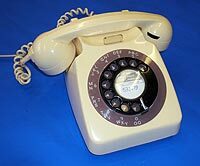 This, together with the later 746 design (1967) became the standard offering for subscribers and remained so through until the 1980s. 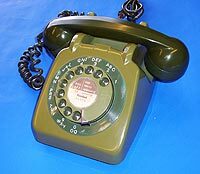 However, it remained the policy that you rented your telephone from the GPO; they were not available for purchase. 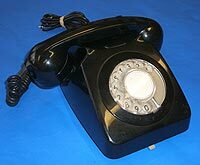 Manufactured by Phoenix Telephones, Hendon, London (PX) in 1962 (62/2). Letters and numbers on dial and surround. 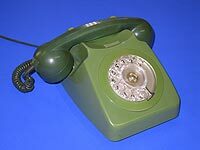 Manufactured by GEC Telecommunications, Glenross, Scotland (AEG) in 1966 (66/2A). Modified by the GPO Factory in Cwmcam, Wales (FWR) in 1973 (73/2A). 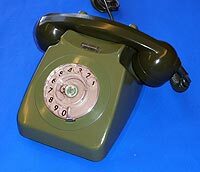 This model was manufactured by GEC Telecommunications, Glenross, Scotland (AEG) in 1966 (66/2A). Letters and numbers on dial surround. This 706 model is labelled N1900E244. Manufacturer and date unknown. Manufactured by Denis Ferranti Meters Ltd., Bangor, North Wales (DFM) in 1969 (69/1). 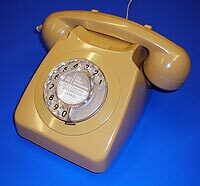 Manufactured by Plessey, Speke, Liverpool (SPK) in 1969 (69/1). This model is fitted with an earpiece amplifier. 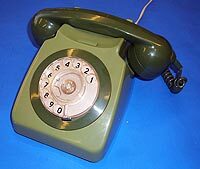 GPO 746F Two-tone green rotary dial telephone. 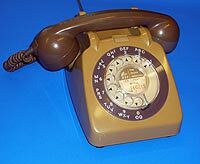 When originally released, the 746 telephone case had a shallow recess for the handset as shown on the right of this picture. 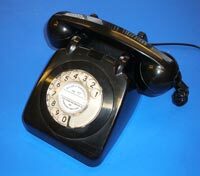 However, problems were encountered with the handset not sitting properly and therefore not depressing the 'on hook' buttons fully. In later models the case was redesigned with a more pronounced recess as shown on the left of the picture. 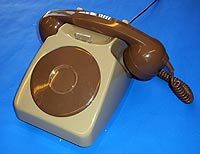 Here the handset sits firmly within a more square cut recess. 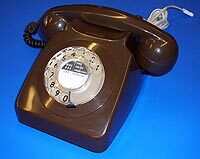 Manufactured by PYE Telecommunications (CW) in 1971 (/71). 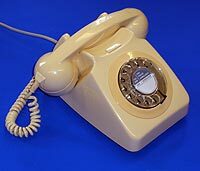 This version is fitted with an original style 746 case with the broad, shallow handset recess. 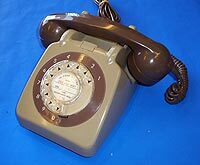 It also has a ringer control lever at the front which was used to adjust the loudness of the bells. 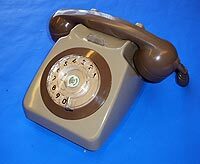 It is assumed that this model was manufactured by Plessey for it carries the manufacturer's code of PLU. 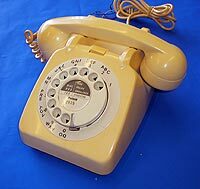 It was manufactured in 1971 (71/1). Manufactured by Foster's Machine Tool and Engine Company (FM) in 1973 (73/1). 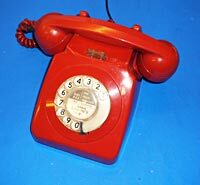 This example was manufactured by Denis Ferranti Meters Ltd - Bangor, N. Wales (DFM) in 1973 (73/1). Manufactured by Denis Ferranti Meters Ltd., Bangor, North Wales, (DFM) in 1974 (74/1). 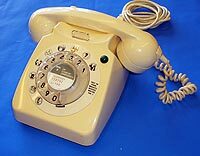 The 8746 telephone is a version of the 746 with modified circuitry to make it suitable for use with a plug and socket interface. This one came from St. Pierre Park Hotel, Guernsey. 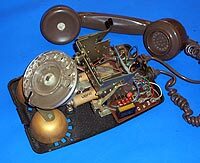 The telephone was manufactured by Denis Ferranti Meters (DFM) in 1982 (82/2). It has a light to indicate if a message is waiting for the customer. Changing the cover on your mobile phone is a recent trend. 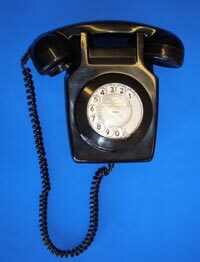 Here is a much earlier example of a cover for your GPO 746 telephone! 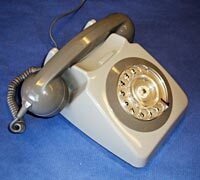 This two tone grey example is presented with a lighter grey handset and dial surround compared to the more usual darker brown colouring. It is a type 8746G indicating that it has modified circuitry to make it suitable for use with a plug and socket interface. 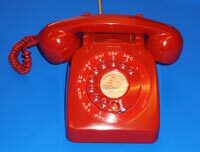 It was manufactured by STC Consumer Electronics - Cwmcarn (FWG) in 1985 (85/1).